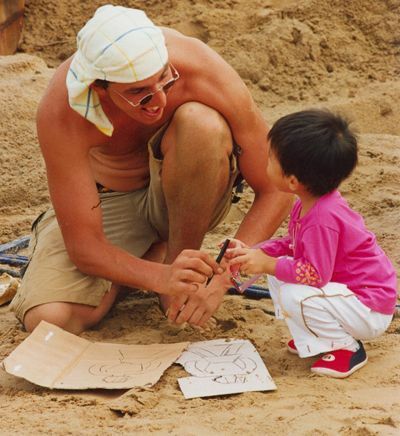 IN 1999, Zhoushan people have introduced sand sculpture from European and American countries to China. From then on, zhoushan sculptors and sand sculpture group have been taking sculpture as a vocation and attended many activities both at home and abrord. At present, there are 60numbers who have rich experiences and excellent skills of designing and caving in the Zhoushan Sand Sculpture Committee. In the group, Zhang weikang and Zhang yongkang, called "sand sculpture brothers" have won the second prize in domestic group in the 2ed Zhoushan International Sand Sculpture Festival; Yangkewei has won the second prize in the 2003 National Sand Sculpture Invitational Tournament sponsored by China Sand Sculpture Committee; Ren jiangying and wang shanzhou have had good achievement in the 2002 National Sand Sculpture Invitational Tournament and attended the 3ed Zhoushan International Sand Sculpture Festival as a group number, then they have taken part in exhibitions of sand sculpture works in Kongming and Dalian in succession; Wang jieming and He ming who are professional art teachers with steady foundation of art and rich experiences of sculpture have taken part in the Zhoushan sand sculpture festivals to cave large combination works .the number of the group cooperate closely ,work hard and present delicate sand sculpture works for the tourists from all over the county.